Betty the Sweet Aspiring Mountain Mama made a wonderful artisan bread bowl made in a green Dutch oven. 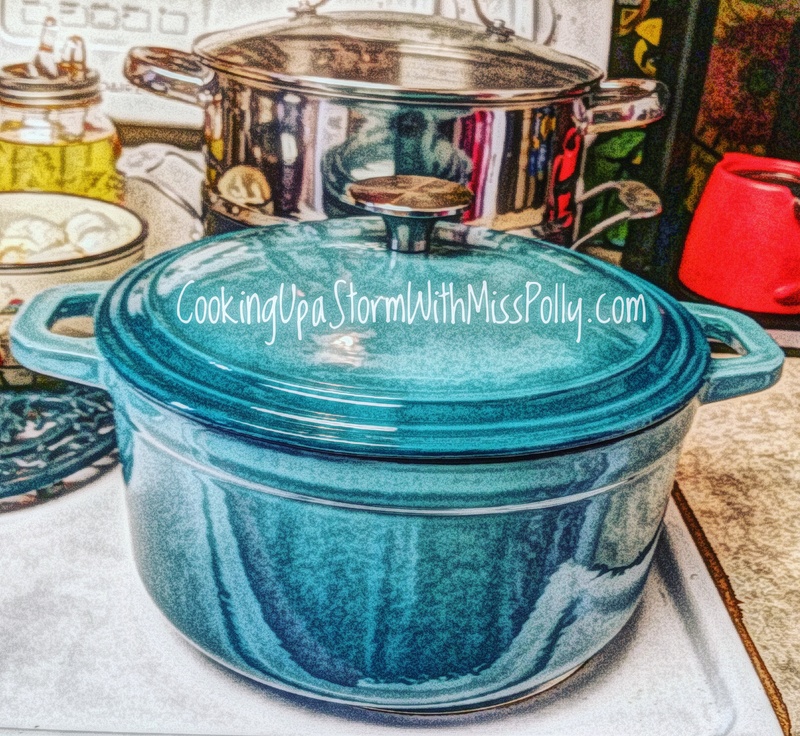 I found her recipe on her blog and I couldn’t wait to make it period I didn’t have a really nice Dutch oven I had to get rid of mine in California when I moved to Las Vegas, because the thing weighed so much and I was getting rid of everything that was heavy and that is a fact. It didn’t matter if I liked it or not it was just too heavy to take. So, I got a better Dutch oven than what I even had in the first place by Zelancio with a lifetime guarantee to make not only the bread with but anything else my heart desires. Betty’s Bread came out awesome and the crumb looked wonderful. I want to email her and ask her for some pictures from her blog so I can add them to the story. 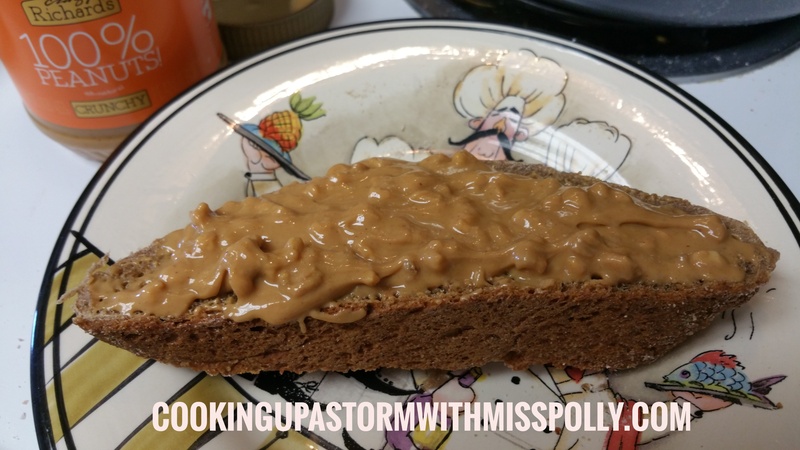 You can make her recipe by following the link below, or you can continue on and make the whole wheat version that has oatmeal in it that I made. Two different Cooks with two different Dutch ovens in two different places making the same bread and add their own Flair to it. 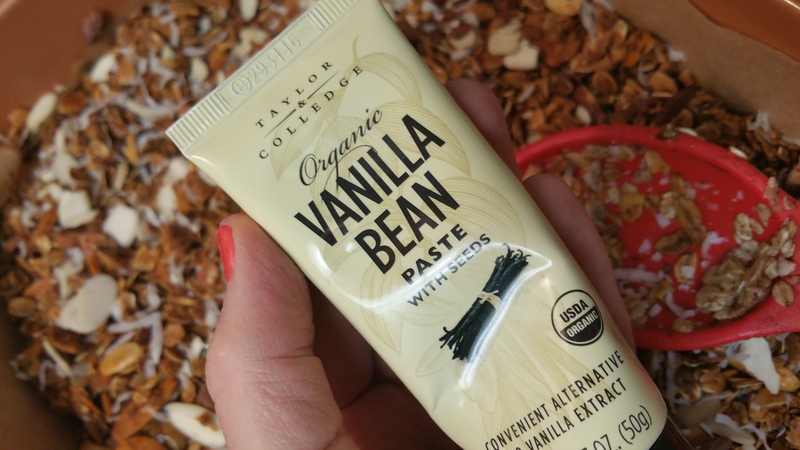 What do you think of that? 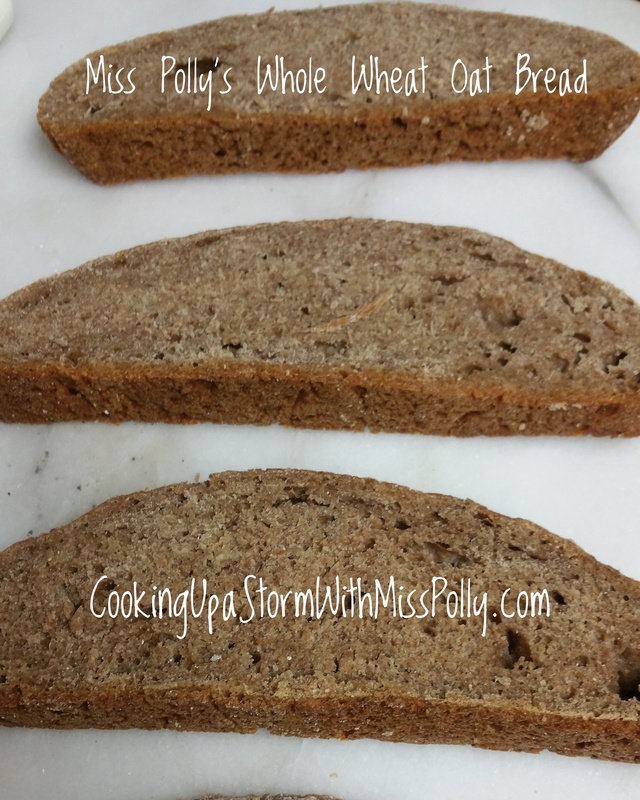 You’re going to love how easy this bread is to make and how fantastic the directions are written to make it. It comes from Aspiring Mountain Mama. 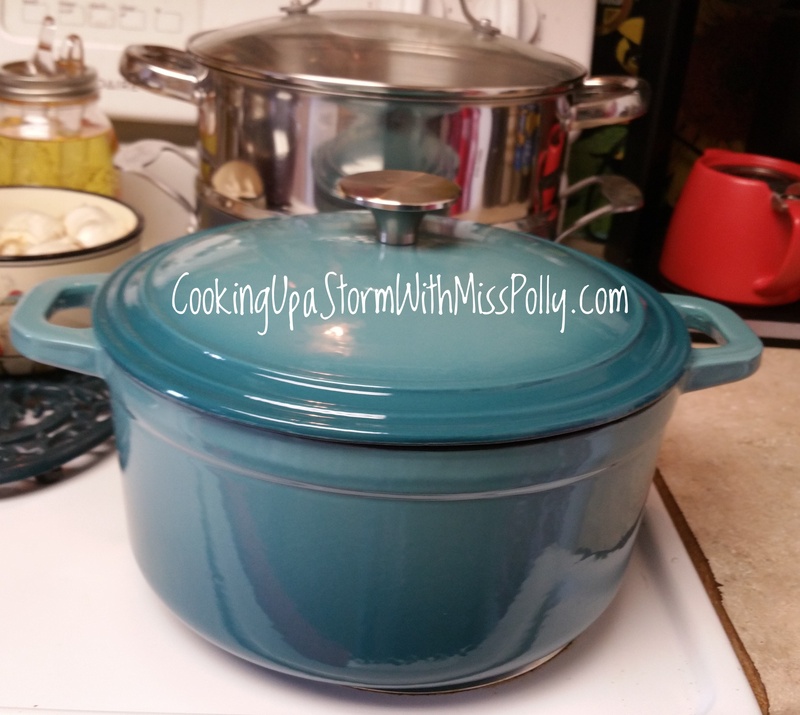 My beautiful ZELANCIO- 6 quart enamel-cast iron Dutch Oven arrived from Amazon today even more beautiful than I even imagined. It makes me forget about the old one I left in California because the thing was just too darn heavy to take to Las Vegas when I moved here! When you’re paying by the wait to move from one state to another things just go period you find out what matters to you really quickly. 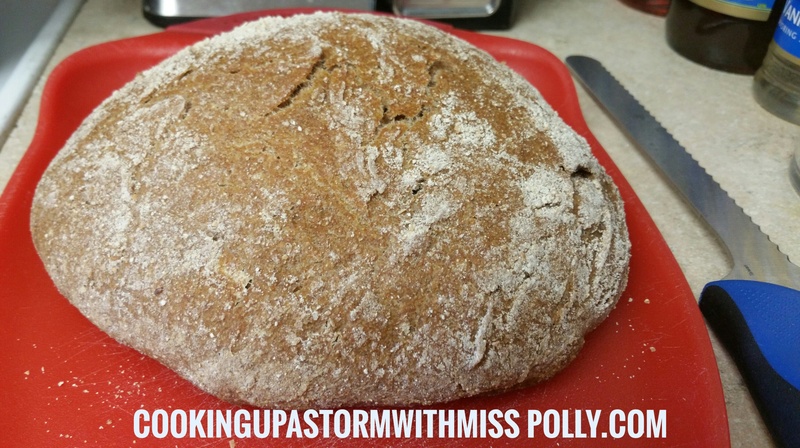 I made a whole wheat version with 100 % whole wheat flour and oatmeal start into the dough. I had some of my bread with some awesome natural peanut butter with no sodium that is 100% natural from Crazy Richard. Here’s a picture of the finished product and it tastes outstanding! Written by and Photography by Paulette Motzko. 3 1/2 – 4 cups warm water- judge list by the feel of it. The dryer your flour is, the more water you’ll need in your bread. 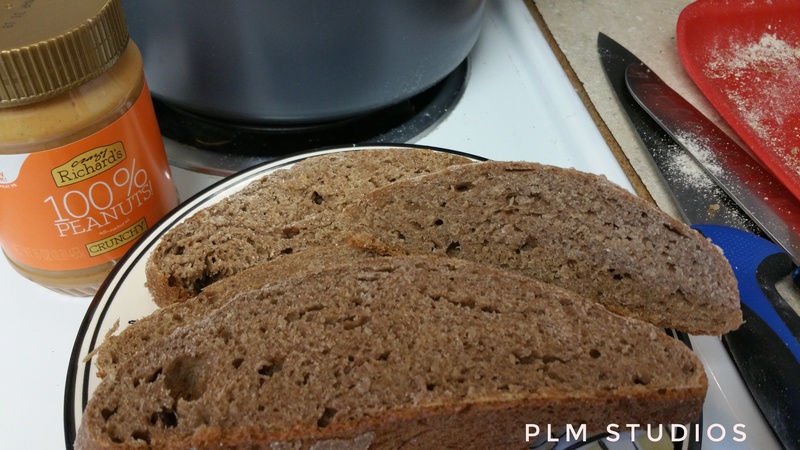 Whole wheat flour requires more water than all-purpose. More moist bread dough is always better than dry because that will reflect how moist a crumb your bread has. I just mixed all the ingredients together about 9 p.m. I then was going to be bake it at 9 a.m. the next morning. 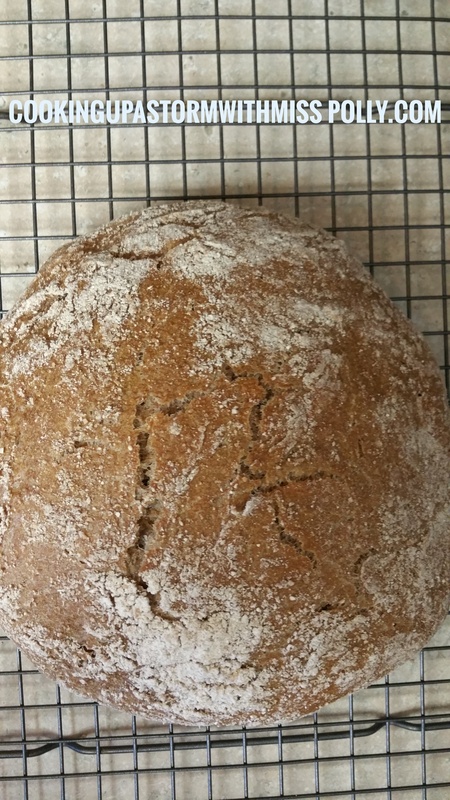 I cloaked the top of the bread ball, (boule) with flour, and then put it into my enameled cast-iron Dutch oven. Before I added the bread I greased the bottom of the pot with some extra virgin olive oil that I brushed on with a silicone basting brush. If you have non stick pans you probably will need to do that. I did not preheat my Dutch oven with absolutely nothing in it. I wouldn’t advise that because on my directions it says never ever put your pan in the oven with nothing in it. Once my oven had got up to 450 degrees, I added my bread dough ball and baked it for 30 minutes. After 30 minutes I took the lid off and let it bake an additional 15 minutes to brown it. That’s all there is to it. I recommend letting your bread loaf set for a good 20 or 30 minutes before you cut it. The crumb of the bread is very fragile, even though that the crust has a great firm texture to it. 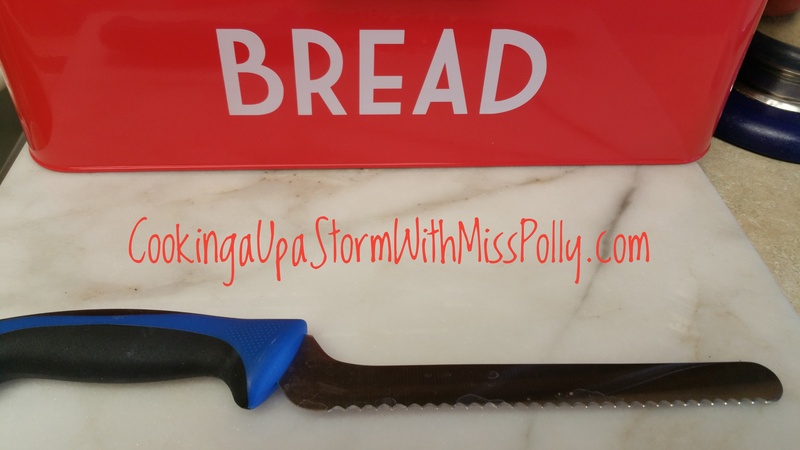 Also use the most Sharp serrated bread knife you can get your hands on to cut it. If you don’t have a really good sharp serrated bread knife, get one. I bought a nice set of Mercer knives with ergonomic handles for my birthday last year. If you invest all the time and effort to bake an extraordinary loaf like this, letting it rise slowly for 12 before baking it with all the love in the world, get yourself a good bread knife and also get yourself an extraordinary bread safe or bread box. 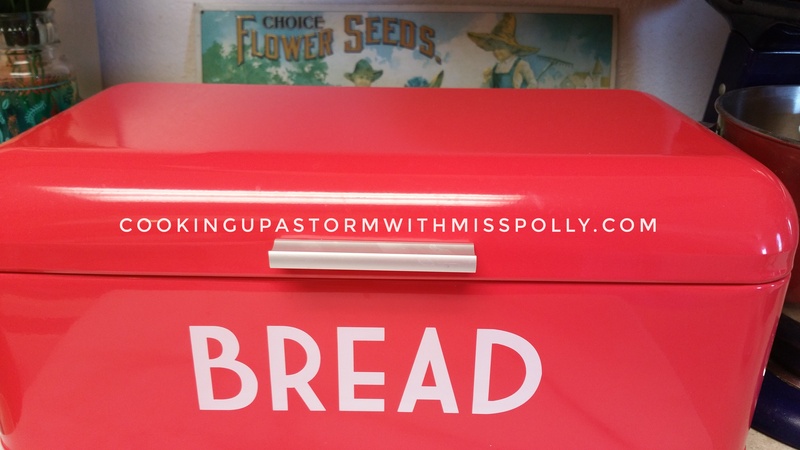 I got an old time bread box and though it cost me $30, but my bread never molds or dries any longer and always stays fresh….that makes Polly Motzko the baker very happy. I will take a picture of it and add it to this story. I’m very happy I got it. The weather in Las Vegas Nevada is merciless and it’s either too dry or too dry. That means your bread can really be like a rock right after you make it comma unless you have a bread safe. 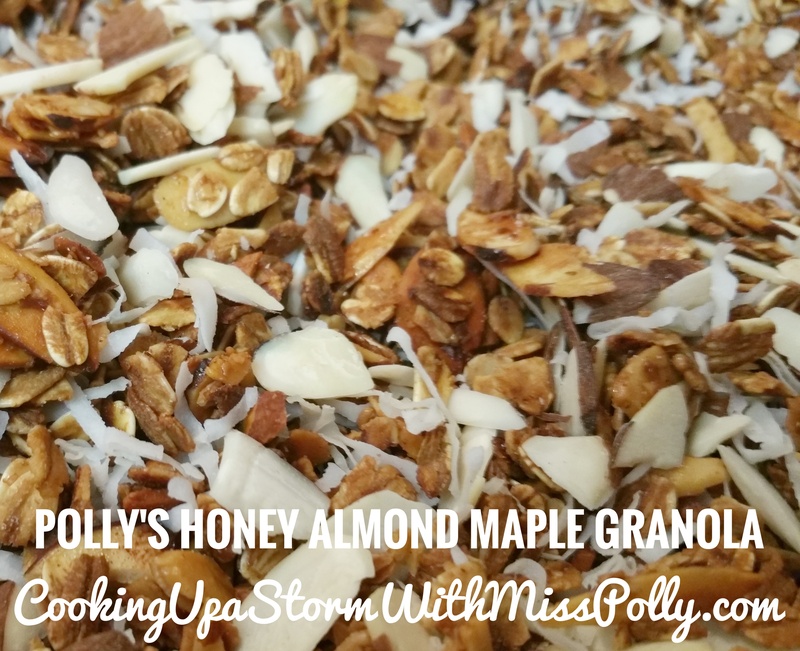 Paulette Motzko June 9th 2017 at 5:13 p.m.
June 10th, 2017 at 11:45 a.m.
Add in desire’s cups of dried fruits and nuts to the finished granola in an over sized bowl and stir until combined. 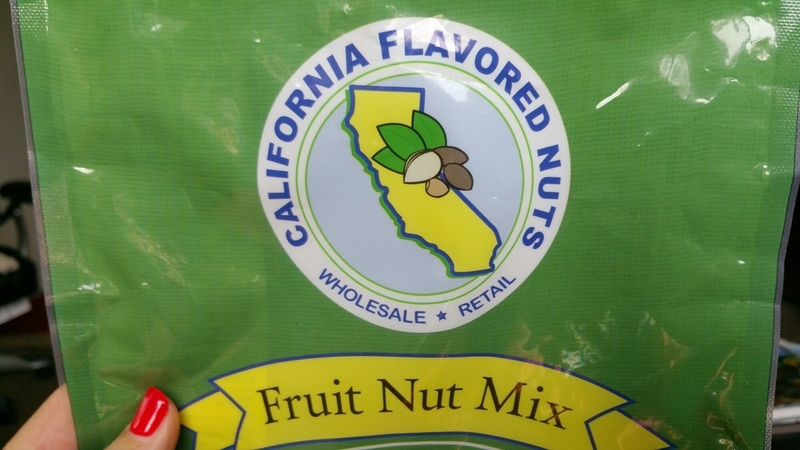 I used California Flavored Nuts brand Fruit Nut Mix that I found a Cardenas Supermarket. Cook in 2 large greased pie pans, that have been sprayed with nonstick cooking spray. Cook in the microwave, stirring every 3 minutes with a rubber scraper. Don’t overcook, but just until most of the moisture is gone but not overbrowned. 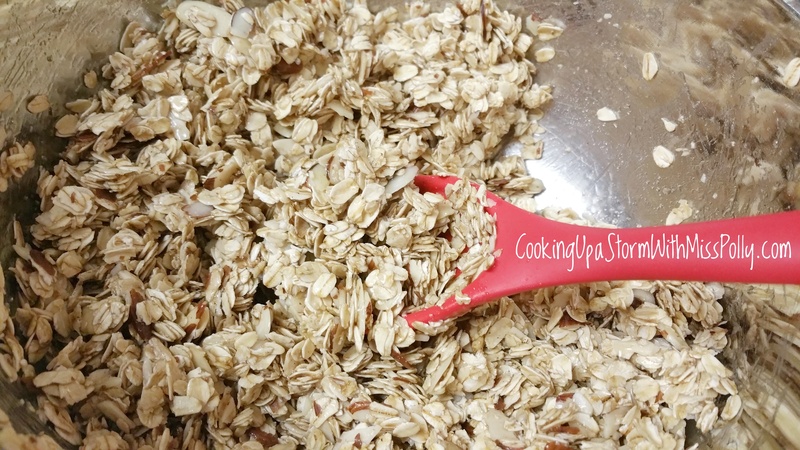 Stir cooked granola into a very large bowl and then add in however many cups you would like of the fruit and nut mixture and stir the next throughout. 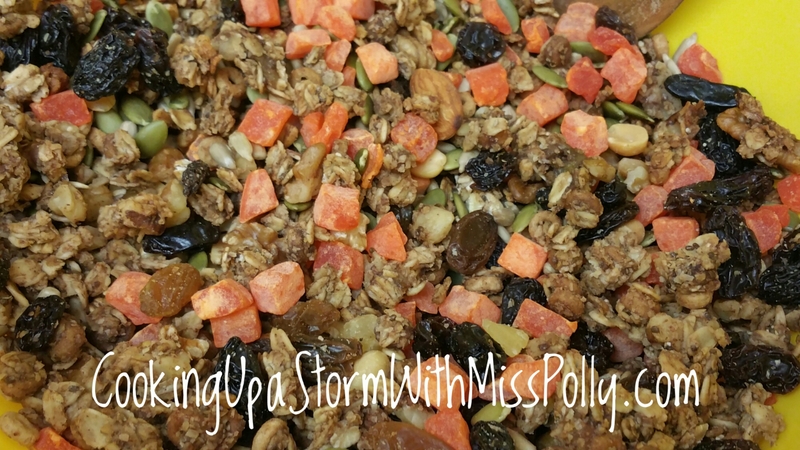 After the granola is cooked in the microwave add however many cups of the CA Fruit and Nut Mix with pumpkin seeds, pineapple, walnuts that you like. Avoid trail mixes with either banana chips yogurt covered raisins or chocolate chips. 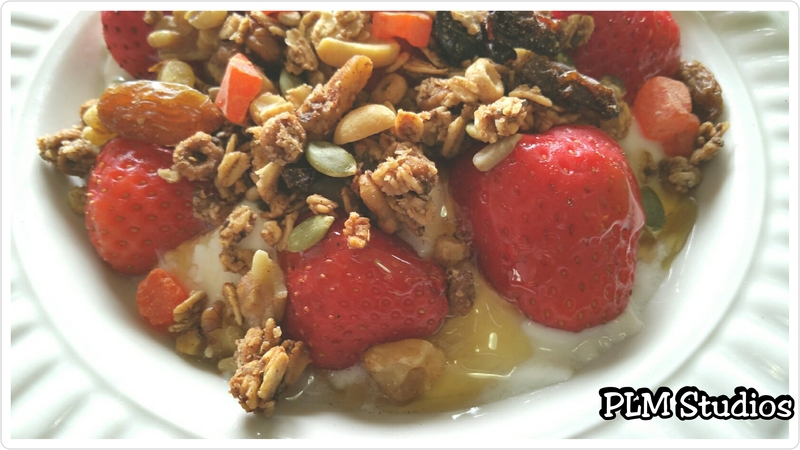 *The trick to making granola that is crunchy with moist fruit is adding your fruits after the granola has been cooked. 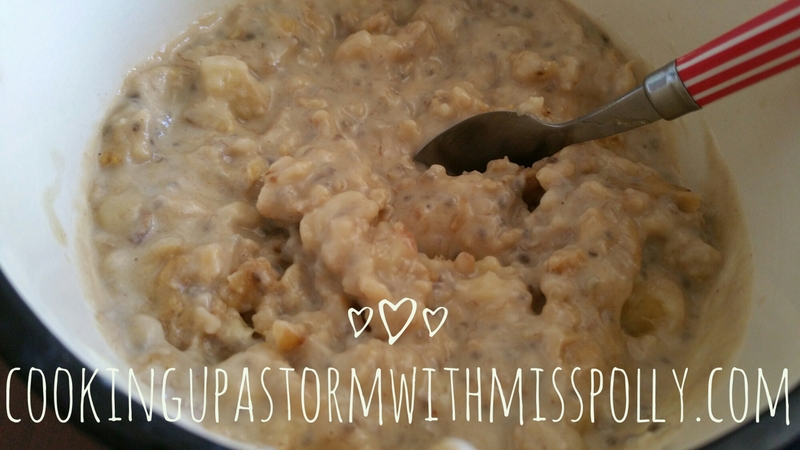 This is the same exact recipe as the Pumpkin Pie Spice Granola except you simply replace the pumpkin with 2 mashed bananas.